Private out patient consultations are available Monday - Friday and in urgent situations can often be arranged out of hours. If you wish to see a specfiic consultant, these will be scheduled on certain days. Out patient appointments are available at Spire Hospital Southampton, with satellite clinics at Lymington, Nuffield Chandlers Ford and at Sarum Road Winchester. To arrange an appointment, contact us or phone our office staff. We will normally require a referral from you General Practitioner. Although appointments can be made directly, this may affect your health insurance cover if you have not been referred by your GP. In addition to being providers for all the major health insurance companies we are happy to see self-paying patients. Non-Invasive Cardiology investigations are so called because they are painless and involve no needles! These tests are commonly requested by Cardiologists when investigating your heart. Wessex Cardiology provides a number of non-invasive cardiac investigations including exercise ECG testing, echocardiography, 24hr ECG monitoring, cardiomemo recording and 24hr blood pressure monitoring. These investigations may be recommended following a consultation with one of our Cardiologists or may be booked separately if required. All investigations are available by contacting Wessex Cardiology and all investigations are reported by one of our consultant cardiologists. Patient information about this can be found here. 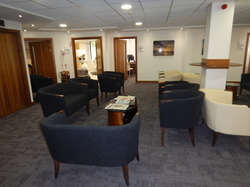 Wessex Cardiology has a particular expertise in the area of Stress Echocardiography. Using echocardiography to assess wall motion abnormalities under rest and stress (either exercise or pharmacological stress) it is possible to identify the presence and extent of myocardial ischaemia and myocardial viability. This out patient investigation is often used as an adjunct to coronary angiography to target appropriate revascularisation but can also be valuable as a diagnostic tool for determining the likelihood of coronary artery disease in an individual patient. Referral for Stress Echocardiography is generally undertaken by a cardiologist following clinical assessment. Patient information about this can be found here. Transoesophageal Echocardiography is undertaken as a day case procedure under conscious sedation. We have dedicated endoscopy facilities which are utilised for Transoesophageal Echocardiography. Wessex Cardiology consultants undertaking this procedure have an international reputation in the field of echocardiogaphy. Patient information about this can be found here. Coronary angiography remains the gold standard for the diagnosis of coronary artery disease and assessment for its treatment options including PCI (Percutaneous Coronary Intervention). Performed as a day case procedure under local anaesthetic, Wessex Cardiology have access to modern cardiac catheterisation facilities at Spire Hospital Southampton. High resolution, digital images allow accurate interpretation of the extent and severity of coronary artery disease undertaken by experienced Wessex Cardiology consultants. Patient information about this can be found here. Heart failure is becoming increasing sophisticated in its diagnosis and management. Wessex Cardiology has the facility to provide rapid and accurate diagnosis of heart failure and determine its underlying aetiology. Peter Cowburn, our heart failure specialist is one of the national authorities in heart failure management and has a particular expertise in the pharmacological and device management of heart failure. Patient information about this can be found here. Wessex Cardiology have been performing PCI at the Spire Hospital (formerly BUPA Southampton) since 2003. The interventional cardiologists of Wessex Cardiology are nationally and internationally recognised for the quality of PCI in Southampton through their work at the Wessex Cardiac Centre. With the use of clinically proven drug eluting stent technology and rapid development of specialist technology to do these procedures, such as pressure wire and intra-vascular ultrasound assessment, Wessex Cardiology now does these procedures at the Wessex Cardiac Centre across the road at Southampton General Hospital. The state of the art facilities here combined with continuous cardiothoracic surgery and cardiothoracic intensive care cover means you can relax in the knowledge that you can have your procedure in the safest possible environment, that provides expert care and cover 24 hours a day, seven days a week. Patient information about this procedure can be found here. Wessex Cardiology undertakes all forms of cardiac pacing for brady-arrhythmias, including single and dual chamber pacing using the latest in cardiac pacing technology. In addition, cardiac resynchronisation therapy (CRT) pacing is undertaken via our Heart Failure specialist, Dr. Peter Cowburn. This sophisticated therapy requires careful assessment and monitoring to target suitable heart failure patients and maximise the long term symptomatic and mortality benefits of CRT. Patient information about this can be found here.